Side branch sacrifice : Smart cardiologists shall do it scientifically ! This seems to be good side branch sir, … a resident was mumbling as he was reviewing the RAO caudal test shot .Forget that diagonal man , focus your mind on main vessel , If you keep pitying these small twigs , you can never become a glorified Interventionist .I heard one of the senior consultant was telling (rather yelling) at his assistant ! I used to wonder ,why should the fate of side branches be decided by the mercy of semi cardiac Intellectuals ? What determines the hemodynamics after side branch jailing ? How do you classify side branch jailing ? Okamura et all (Ref 3)offered a new OCT based classification based on the shape of the jail grills. JACC Cardiovascualr Interventions 2010 : Okamura types V, T , and H jails. Implications are many both during short term as you cross , recross /rewire etc.Long term implications are largely unknown. Does Jailing Implies flow is Interrupted ? This is the most critical question, We got the answer from University of Southampton in 2007 a rare and vital contribution to the knowledge base of coronary physiology. It said the struts won’t block the flow, it simply bumps on the path of blood. Markers of significant side branch compromise. For most of us it is not a big deal .I think there is none .There are little discussion on new onset angina or troponin elevation after side branch jailing. Can we Jail LCX ostium (or even LAD ostium ) during Left main PCI ? Jailing a side branch can be casual or even a fashionable act , but can you do the same for left main bifurcation ? It’s all about what you mean by side branch ? and the reaction time , and the useful muscle mass the branch would supply etc. In emergency situations , there has been occasions one even put a stent across left main to LCX.Tackle the jailed LAD later if required. Doing a FFR to assess the significance of side branch is simply a obsessive academic exercise .It is not warranted in most clinical situations. This study has taught us most side branches retain good FFR give us more confidence to sacrifice the sibling branches of main stem arteries. Practicing cardiology in a truly professional way in cath lab can be tricky.We need to disrespect most of the side branches .Believe in your gut feeling (or your consultant’s.) 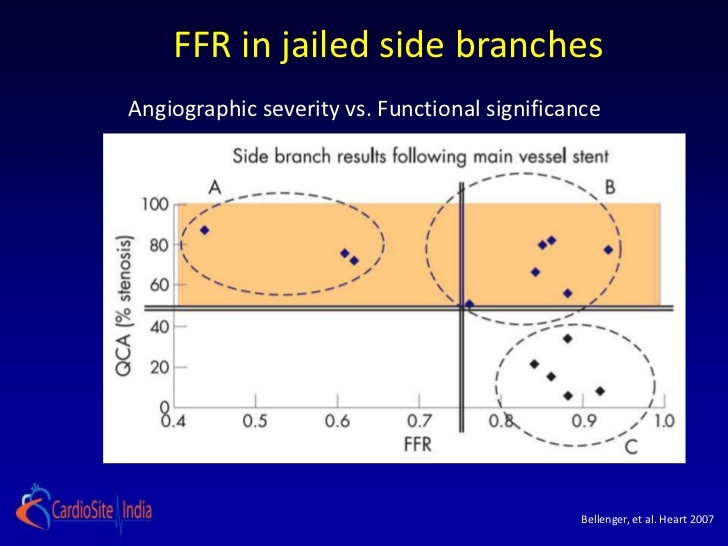 If you are a sensitive scientific cardiologist do FFR pre / post procedure to the side branch .If compromised physiologically try probing the jailed struts and dilate one of them in absolute blindness , of course with a strong conviction of doing good for the science’s sake.